What's the first thing people want to do when their braces come off? According to an ArchWired Reader poll earlier this year, they want to get their teeth whitened! After all, you've put up with several years of braces, and now you want that dazzling, perfect movie star smile (or as close to it as you can get). Damn right, you deserve it! Until recently, you had to pay hundreds of dollars to your dentist to produce stellar results. However, those same results are now as close as your corner drugstore -- at a fraction of the cost. Many of the "over the counter" products sold in stores are as powerful as those used in the dentist's office (and use exactly the same active ingredients). Even with this convenience, some people still opt for in-office whitening, which offers convenience, speed, and precision. So, should you get your teeth whitened in a dentist's office, or should you do it yourself at home? It all depends on your specific teeth, and how much time and money you are willing to spend on whitening. If you are skittish about plunging into the plethora of OTC whitening products, and you don't mind spending several hundred dollars for professional whitening, then having the in-office treatment might be your best bet, especially if you have a history of tooth sensitivity or gum problems. If you are willing to pay around $500 and demand results in an hour, then head to a place like Brite Smile, where a special light speeds up the chemical reaction (thereby producing quick and dramatic results). Many dental offices now offer laser whitening, which uses a similar one-hour process aided by a laser light (at a cost of around $1,000). The advantage of in-office treatment is this: it takes the responsibility (and mess) out of your hands. You get fast, professional results, and you don't have to worry about doing anything wrong. Aside from the strictly "in-office" treatments, some dentists do an initial in-office whitening with a very strong bleaching solution, then give you a kit with a weaker bleaching solution to use at home. This generally costs between $200-$350. The active ingredient in these take-home kits is exactly the same as those sold in drugstores. Your dentist decides the best strength of solution for your needs -- so you are paying for an initial in-office treatment, a set custom mouth trays, a bleaching solution tailored to your needs, and your dentist's expertise in helping you understand the process. If you decide to do it yourself, the mere selection of one product can make your head spin. There are so many kits to choose from -- promising results from several weeks to only 2 hours! Search the internet and you'll end up even more confused. Some of the kits seem very "dental" and utilitarian. Some are packaged to look more upscale and are sold in spas of New York and London. And then there are the Whitestrips. Which should you choose? That depends on your needs, your budget, and the amount of time you are willing to devote to whitening. Most whitening kits use a form of Peroxide to bleach the teeth. The most popular formulations, including those used by most dentists, contain Carbamide Peroxide. Other types of kits, including the Crest Whitestrips, use Hydrogen Peroxide. Both of these Peroxides do the same thing, because they have a chemical relationship! Chemically, Carbamide Peroxide (also known as Urea Hydrogen Peroxide and Perhydrol-Urea) is CO(NH2)2.H2O2. It breaks down into Hydrogen Peroxide [H202] and Urea [CO(NH2)2] in an aqueous solution. A solution of 10% Carbamide Peroxide breaks down into approximately 3% Hydrogen Peroxide (therefore, a 22% Carbamide Peroxide solution breaks down to about 7.5% Hydrogen Peroxide). So if all these kits contain essentially the same active ingredient, what is the difference between them? Answer: the concentration (strength) of the Peroxide solution, and their PH. Whitening kits can contain anywhere from less than 10% strength all the way up to 22%. Some kits contain a combination of other ingredients which act as buffers to reduce sensitivity. But no matter what kit you choose, it all bubbles down to Peroxide. In-office, some dentists initially treat patients with a 35% Carbamide Peroxide solution, then send them home with custom trays and syringes of solution ranging anywhere from 10% to 16% in strength. OK, then it's a no-brainer! Just look for the highest number, right? Well, it's not quite so simple. You see, Peroxide is caustic to human tissue, and has a nasty habit of temporarily "burning" your gums (causing white spots which disappear in a day or two -- or even bleeding). It can also make your teeth feel sensitive. So if you have never whitened before and you go right for the 22% solution, you might be hating life for several days or weeks -- ouch! The safest thing to do is find a whitening kit that offers a solution around 15% Carbamide Peroxide. This will be strong enough to produce results without causing a lot of discomfort. Unfortunately, many kits don't readily reveal the strength of their solutions. You can assume that a kit which directs you to wear the solution for an hour or overnight will be weaker than one which directs you to wear it for only 20 minutes! When in doubt, call the manufacturer. Ask what form of Peroxide their kit uses, and the strength of their bleaching solution. What about the custom tray that your dentist makes -- that plastic "Invisalign"-like mold that fits to your teeth? If you have an Essix retainer, you can use it as a custom whitening tray. If you don't have an Essix retainer, you will need some sort of tray to deliver the whitening solution to your teeth. Many at-home whitening kits offer some sort of tray device. Some are made of a soft silicone or plastic material which can be heated in warm water and molded to your teeth. Although this isn't quite as "perfect" as a custom tray, it will still produce really good results. Other more expensive kits provide the tools for you to make a mold of your teeth. You send the mold to the lab, and in about a week, the lab sends you a custom-made set of mouth trays. You can also ask your dentist or orthodontist to make a set of mouth trays for you -- but it may cost $100 or more (be sure to ask -- you never know -- your dentist may be less expensive). Depending on how often you plan to whiten, it may make sense to to have a custom tray made -- after all, you'll have it forever! If your teeth have a history of sensitivity, I strongly recommend that you brush with a de-sensitizing toothpaste like Sensodyne for at least two weeks before attempting to whiten. Then, use a whitening gel which isn't too strong -- between 12% and 16%. My teeth are terribly sensitive to cold, and frankly I was afraid to whiten them. Oddly enough, even using an 18.5% solution, I did not experience any extra tooth sensitivity from whitening (although, it did temporarily burn my gums a little bit and produce the dreaded white spots). However, your results may vary. When in doubt, err on the side of caution and use a weaker bleaching solution. 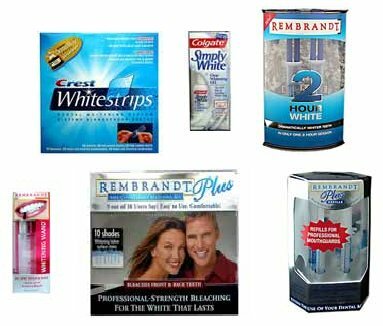 How long should that bleaching solution stay on your teeth? The weaker the solution, the longer it needs to be on your teeth to produce results. As I stated above, the strength you choose depends on your tolerance to the Peroxide. It all depends on your tolerance level and the amount of time you are willing to devote to whitening. A weak solution used overnight for seven days will produce the same results as a strong solution used for an hour for seven days. The only difference is time and tolerance. Always be sure to always follow the instructions, and don't leave the Peroxide gel (or Whitestrip) on your teeth any longer than directed. Doing so can harm your teeth and gums. Yes, there are some risks in at-home whitening. Don't be overzealous and whiten too much or too often! Use the product as directed, and then stop, or you could run the risk of wearing away your enamel (especially if the bleaching solution is highly acidic). When in doubt, ask your dentist for his/her opinion. Here's an article from the Canadian Dental Association about the safety of tooth bleaching products. Remember, you can only improve what you were born with -- your teeth may never look snow white, no matter how much you bleach them. So, be reasonable! Remember, many "perfect" teeth you see in magazines may be professionally altered with bonding, veneers, or photo enhancing software! There have also been some concerns about Peroxide contributing to a rising number of early mouth cancers. Also -- it should go without saying...DO NOT attempt to whiten your teeth while you are still in braces! The Peroxide could affect the bond of the glue on your brackets. Also, you could wind up with a big yellow square in the middle of your teeth after your brackets come off! Save the whitening for after the braces come off (and that includes whitening toothpaste). What about the results? As your dentist will tell you, the results depend on your teeth. Both types of Peroxide solutions are great for removing most common stains (wine, coffee and tea, tobacco, aging, etc). Other types of systemic stains, caused by Tetracycline or Fluorodosis may not respond well to bleaching. Dental work such as crowns, bonding, veneers, or composite fillings will not respond to bleaching. So, if you plan to have some bonding done after your braces come off, whiten first, so the bonding material can match the color of your white teeth! Many people complain that their teeth are streaky after whitening. If this happens to you, don't be alarmed. The streakiness generally disappears in a day or two, leaving your teeth with an even tone. Here's a good rule of thumb: don't whiten the same day as an important event or a photo shoot. Wait a day or two, just in case you get streaky results! Crest Whitestrips use Hydrogen Peroxide to bleach the teeth. You can buy this product in your local drugstore, or for slightly more money, get the Supreme strength from your dentist (this kit comes with a Spinbrush and a tube of whitening toothpaste). The bleaching solution in the Supreme kit is 14% strength; the regular kit available in most drugstores is 6.5% strength. You use the Whitestrips for 30 minutes twice a day, with final results in about 21 days. The directions recommend that you use them for 21 consecutive days to produce the desired results. Crest Whitestrips are a thin flexible plastic-like membrane coated with whitening gel. You place the strips on the front of your teeth and gently wrap them around the undersides of your teeth. This effectively creates a thin membrane "tray" which is barely noticeable to other people. However, the strips can slip from your teeth slightly if you move around or talk a lot, so it is best to wear them when you're sitting still or doing a sedentary activity. If your teeth are not very straight, you may have trouble applying the strips. And, they are not as effective at removing between-teeth stains as other gels. In my own experience, the Whitestrips did produce nice results after only a few treatments. Unlike the Carbamide Peroxide gel of the other kits, the Whitestrips did not leave my teeth streaky-looking -- they just looked uniformly whiter. My dentist says that his patients have enjoyed good results with the product, and I agree that it is a good alternative to gels and plastic trays. I had a professional sample of some gel that was 16%, and it was much more comfortable and did not burn my gums, even after wearing it for an hour (as the instructions directed). I didn't use the Rembrandt kit in the recommended 2 or 3 hours straight -- I didn't think my gums would be able to stand it! Instead, I used it for 20 minutes once per day until the gel was used up -- which took almost a week. By the end of the week, my teeth looked great, at least 4 shades whiter (and all the yellow stains were gone)! At first I experienced some streaks, but they went away after a couple of days. I also tried the Crest Whitestrips Supreme. These are quite convenient and produced a nice, even tone with no streaks. The downside of the Whitestrips is the amount of time it takes to produce dramatic results: almost a month. I decided to save the Whitestrips for touchups, and give some to my husband! 1. What ingredient does your "kit of choice" use: Hydrogen Peroxide or Carbamide Peroxide? Are there other ingredients in the solution which help reduce sensitivity? 2. Compare apples to apples. 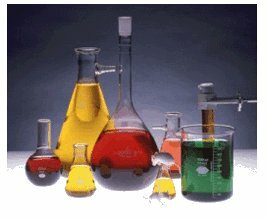 What is the strength the Peroxide solution? (If it doesn't say on the package, call the company's 800 number or visit their website to find out). 3. How long do you need to wear the tray/strip to produce results? How much time are you willing to devote to at-home whitening? 4. Does your kit come with a tray? If so, what kind: do you make a mold of your teeth and get a custom tray from a lab -- or is the tray "generic"? Will you need to have a tray made by your dentist? 5. How sensitive are your teeth/gums. My dentist said (and I believe he is right about this): a weaker solution worn for a longer period of time will produce good results with less sensitivity. If your teeth are extremely sensitive, brush with a toothpaste like Sensodyne for at least two weeks before whitening. 6. Not willing to do it yourself at home? Ask your dentist how much he/she charges for whitening, and check other local dental offices for whitening specials. Now get out there and dazzle everyone with your straight white smile!